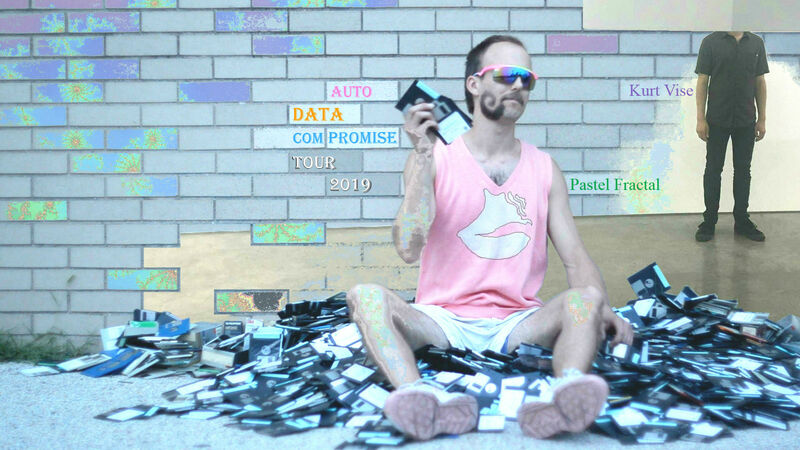 🐚PASTEL FRACTAL🐚 – auto_DATA Compromise Tour 2019!!! Pastel Fractal’s mission is to perform wonders🐚 with the mission statements of Chicagoans. Pastel Fractal’s wonders🐚 are bursting multimedia experiences packed with music and words. They pour out notes, sounds, lyrics and text (specifically, the collected mission statements of Chicago-area people and organizations). They are inspired by the wonder of fractals while embodying a transplanted seaside aesthetic (seashells and pastel colors) and hauling instruments exclusively by human-powered machines (bicycles). Pastel Fractal performs wonders🐚 with the use of the Pastel Fractal Mobile Performance Apparatus – a towering network of recommissioned M.I.D.I. machines (with floppy disk drives) that is transported by bicycle trailer. This apparatus sequences mission statement data that has been reformatted to karaoke files (in “M.I.D.I. + Lyrics” format) which are stored on floppy disks for recalling, displaying, projecting, singing, and remixing during live musical performances. Pastel Fractal’s source for mission statements is primarily the data submitted by participating Chicagoans to the interactive research installations of Alexander DeGraaf. Like these interactive research installations, the Pastel Fractal Mobile Performance Apparatus is built and continuously reiterated based on the research of Alexander DeGraaf. In fact, every instrument, material, tool, technology, image, object, and aesthetic used by Pastel Fractal is determined by this renaissance researcher (Alexander DeGraaf) whose research installations are also similarly structured with repurposed walkers, crutches, commodes, and reclaimed pastel-colored art. Pastel color is light and pale in hue. A fractal is a geometric pattern that repeats at larger and smaller scales. Fractals are formed in nature and mathematics by recursive processes. Fractals are wonders🐚. While performing, Pastel Fractal also uses a seashell of the queen conch species. This seashell is a pastel fractal formed in nature. The multimedia output of the Pastel Fractal Mobile Performance Apparatus is a combination of music, sound, and video that is referred to as CAREoke. Pastel Fractal’s performance of wonders and the CAREoke product can only be experienced LIVE. However, recordings are captured and published for the exclusive purpose of sharing documentation with potential beholders of the live experience. This captured CAREoke can be viewed below. However, some mission statements in these recordings may no longer be current (such as Pastel Fractal’s). 🐚Wonders are qualified by positive experience beyond understanding. FACEBOOK: performance + installation documentation videos, show announcements, etc. VIMEO: performance + installation documentation videos, music videos, one old commercial, etc. YOUTUBE: research videos, leaked media and merch, etc. PLEASE IGNORE THE ADVERTISEMENTS THAT MAY APPEAR BELOW!